The SONOTHERM 1000 Ultrasound Therapy System was developed to overcome many of the significant limitations of other hyperthermia systems. The properties of ultrasound energy enable the SONOTHERM 1000 to treat tumors at depths to 8 cm. This should increase the numbers of patients which can be treated with hyperthermia. Its multi-sector applicator heats to the very edge of the aperture, allowing large tumors (lateral measurements to 15 cm x 15 cm) to be heated. Each of its sixteen sectors can be varied between 0-100% power to uniformly heat across the volume of the tumor being treated. Should one area of a tumor prove to be difficult to heat, more energy can be directed to that segment without overheating surrounding tissue. Depth of energy penetration can be chosen by adjusting frequency (analogous to changing accelerator energy levels). Two frequencies, 1 MHz and 3.4 MHz, permit the operator to select treatment of deep or superficial tumors. And its unique therapy control system uses all temperature measurement points to control energy deposition, a complex task which is not available in any other hyperthermia system. The degree of energy deposition can thus vary dynamically throughout therapy, changing energy levels when needed due to changes in blood flow or the heating properties of the tissues involved in treatment. These features combine to create an entirely new set of capabilities in hyperthermia instrumentation: the ability to control the size, depth and distribution of the therapeutic heating pattern dynamically. The SONOTHERM 1000 Ultrasound Therapy System is equipped with two features which allow it to achieve dynamic control of a shaped hyperthermia pattern: a sixteen sector dual frequency applicator, and a sophisticated control system which uses data from each available temperature sensor to control the energy levels of these sixteen sectors. As any clinician experienced with the use of hyperthermia knows, achieving a controlled therapeutic level of heat throughout a tumor volume is a difficult technological feat. The cooling properties of blood flow and the different heating propensities of heterogeneous tissues complicate the problem of main-maintaining the desired thermal dose within the tumor. Systems offering simple control systems which use a single selected temperature sensor to control power levels can't cope with this complexity. Other systems which claim to control from more than one temper-temperature sensor actually use only one sensor at a time, rather than all sensors simultaneously, to control therapy. And if only one sensor controls therapy, then the heating levels will be uneven and either too high for normal tissue or too low for effective hyperthermic treatment of tumor tissue. Clearly a need exists for equipment which offers the ability to both (1) dynamically control dose during therapy to compensate for the body's physiological responses to hyperthermia and (2) shape the heating pattern to match the treatment area. The SMART Adaptive Planning & Control System, available with the SONOTHERM 1000, was developed to overcome many of the limitations of existing manual and computer-controlled hyperthermia systems. It enables the dynamic control of each of 16 separate applicator sectors, all of which can be varied from 0-100% power to achieve uniform eating across the volume of the tumor being treated. Should one area of a tumor prove to be difficult to heat, the control system can direct more power to that area without overheating surrounding tissue. The system's unique therapy control algorithm uses all temperature measurement points (up to 16) to control energy deposition, a complex task which is not available in any manually controlled or computerized hyperthermia system. The degree of energy directed to the treatment area can thus vary dynamically throughout therapy, changing deposition levels when needed due to changes in blood flow or to the heating properties of the tissues involved in treatment. The SMART system is able to respond quickly to operator commands which override the computer's internal decision algorithm. The system is computer assisted, not just computer controlled, which gives the operator a great deal of flexibility. At any time the operator can modify computer-driven decisions in real-time. This is important, as it allows the operator to put therapy under computer control without relinquishing control. The operation of what is essentially sixteen separate applicators is a job requiring a great deal of "software power." The SMART Adaptive Planning & Control System is run on a Pentium-based computer system with the speed and power to concurrently process the many tasks necessary to achieve dynamic therapy control. Information is displayed via colorful, human-engineered graphics screens so that it is easy for the operator to view the progress of treatment. Only the SONOTHERM 1000 offers these capabilities. Multi-sector applicator design varies the pattern of energy deposition in tissue. The SONOTHERM 1000 is equipped with a unique sixteen sector applicator. Each sector is independently controllable, allowing energy deposition to vary dynamically throughout therapy. The SONOTHERM 1000 comes equipped with a large 15 cm x 15 cm multi-sector applicator for the treatment of large, deep, or superficial tumors. A small 7.5 cm x 7.5 cm applicator is available to treat anatomical sites difficult to reach with the large applicator. Other manufacturer's applicators are not capable of contouring the energy field to the tumor. Even so called "multiple element" applicators are simply separate applicators used together. Cold spots between applicators are the norm, and the "footprint" of the energy delivered to the site is the same no matter what the size, shape or morphologic nature of the tumor. The SONOTHERM 1000 multi-sector applicator, however, can create a uniform thermal dose across the face of the tumor by emitting a shaped, non-uniform energy pattern. The applicator directs more energy to well-perfused areas, less to necrotic areas, and minimizes energy deposited in normal tissue. No cold spots exist between sectors. Power delivered to each of the sixteen sectors is varied from 0-100% dynamically, using either computer or manual control, to maintain the desired thermal distribution within the treatment region. Dual frequency control allows the depth of penetration to be chosen. The applicator's dual frequency design allows the operator to vary the depth of energy penetration. The SONOTHERM 1000 allows the treatment of superficial/subcutaneous (surface to 3 cm) to relatively deep (to 8-10 cm, depending upon tissue type) tumors using the same applicator. The frequency is altered at the push of a button prior to or during treatment. No need to change applicators or reconfigure the parameters for therapy control. 16 independently controlled sectors allow the beam shape to be tailored to the tumor size and outline. The operator can alter the frequency to change the depth of energy penetration from superficial (surface to 3 cm) to deep (8-10 cm). the ability to change power levels in each of the sixteen sectors in order to compensate for the differences in tumor morphology and blood flow throughout the treatment region. Thus, the SONOTHERM 1000 provides all the features of other superficial treatment systems plus energy field shaping and deeper treatment capabilities (8-10 cm). 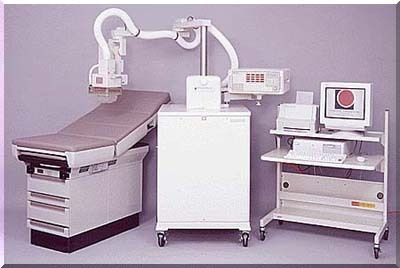 The U.S. Food and Drug Administration (FDA) granted final pre-market approval (PMA) for the SONOTHERM 1000 ultrasound hyperthermia (heat cancer therapy) system on September 29,1989. Thirteen clinical sites in 9 states, including the Dana Faber Cancer Institute at the Harvard Medical School, City of Hope National Medical Center in California, the University of California at San Francisco, and Duke University Medical Center in North Carolina conducted the clinical studies that led to FDA Panel recommendation. Formal notification of this action by the FDA will follow shortly. The SONOTHERM 1000 is the first ultrasound hyperthermia device to gain FDA approval. Its ability to treat large (to 1800 cc) and deep (to 8 cm) tumors gives SONOTHERM 1000 the widest indications for use in the hyperthermia industry. Its unique dual-frequency, multi-sector applicator enables it to tailor the ultrasound energy pattern to match the size, shape and depth of the cancer tumor. The SONOTHERM 1000 ultrasound hyperthermia system is indicated for combined use with radiotherapy in the palliative management of certain solid superficial or to 8 cm malignant tumors (i.e. epidermal [melanoma], carcinoma [squamous cell, non-squamous cell, large cell, infiltrating ductal, transitional cell, and adenocarcinoma], sarcoma or schwannoma) that either are candidates for an initial course of radiotherapy or are recurrent or progressive despite conventional therapy. Use of the SONOTHERM 1000 by trained operators to give hyperthermia therapy in conjunction with external beam radiotherapy has been shown to have statistically significant benefits and acceptable minimal risks for both superficial tumors and tumors to 8 cm deep. Significant clinical responses at the end of treatment were measured from superficial lesions to a lesion depth of 10 cm. Consistently high responses were found at a depth of 6 cm. Better than 50% responded at 8 cm and some cases responded at depths of 10 cm or greater. Mean volume reduction of all partial responders (PR) was 82%. Mean percentage response to 10 cm depth approached 73%; to 8 cm depth, 75%. Pretreatment tumor volumes ranged from less than 10 cc to over 1700 cc. Of tumors treated in the study, 60% had an initial volume greater than 100 cc and 45% were over 250 cc initial pretreatment volume. Ninety-seven percent (97.0%) of the lesions treated showed some response at the end of treatment. Of those tumors where follow-up volume measurements were taken, response levels rose from 70.5% at the end of treatment to 84.8% for lesions with follow-up data. Of the treated protocol lesions, 53% were treated in conjunction with initial radiotherapy and 47% were recurrent or progressive disease.